30oz double wall vacuum copper insulated tumbler. Keeps Hot for 12+ hours, keeps cold for 24+ hours. 18/8 stainless steel, sweat free, BPA free and easy to clean lid. Imprinted Rosie the Elephant logo over "Rose-Hulman" over "Fightin' Engineers" in black. Neil enamel travel tumbler. Cardinal background with a Rosie the Elephant over "Rose-Hulman" over "Fightin' Engineers" screen printed on both sides. Neil enamel travel tumbler. Black background with a Rosie the Elephant over "Rose-Hulman" over "Fightin' Engineers" screen printed on both sides. Nordic 16 ounce white insulated travel tumbler. "R" over "Rose-Hulman" over "Institute of Technology" in cardinal on both sides. Stainless Steel 8 oz. pocket canteen with pewter "R" over "Rose-Hulman" over "Institute of Technology" medallion attached on front. Has a screw off lid that swings to the side. Spirit Dr. Seuss Sippy Cup. 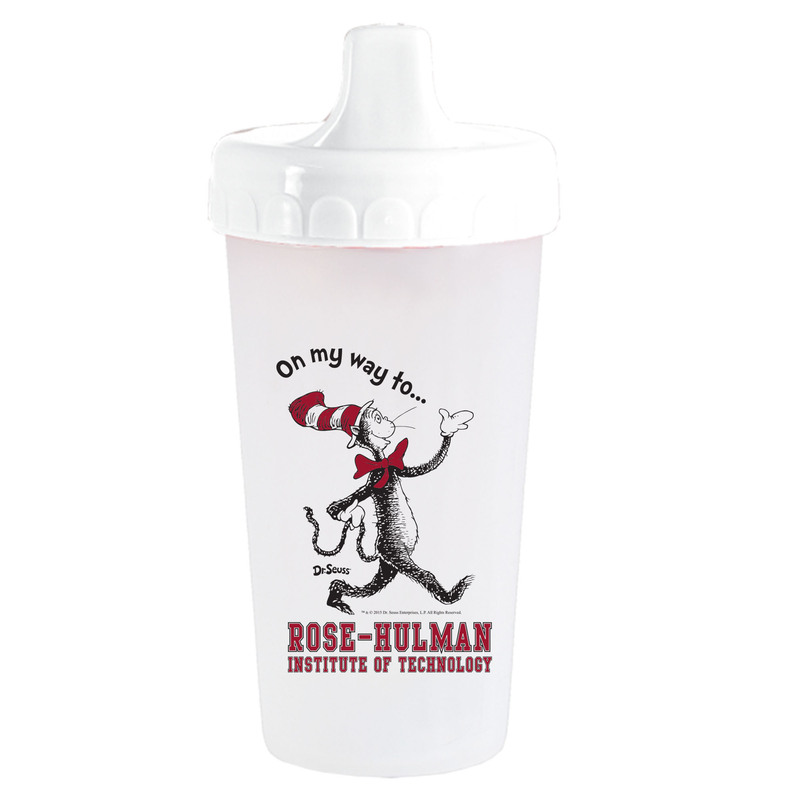 "On my way to....Rose-Hulman/Institute of Technology" printed on both sides of cup. Ounce and mL markings. 9 oz. cup.